Are you moving to Spain? If so, you'd better read up on how to make traditional cuisine. You may have had some traditional Spanish recipes before, but some can only be made with local ingredients. Traditional Spanish cooking is simple but absolutely delicious. All it takes is the right ingredients and a little know-how. If you haven't relocated yet, enjoy this guide and try some recipes to get you in the mood. Are you ready? Let's get going! When you think of Spanish food you may think of rice and beans. But Spanish cuisine is much more than that. Many ingredients are commonly used. Ham, chicken, eggs, fruits and vegetables, legumes, nuts, lamb, pork, and more are often used in Spanish cooking. Several cooking methods are used as well, including stewing, roasting, broiling, grilling, and baking. In other words, there's a lot of variety to be found in Spanish cooking. The traditional recipes are full of the flavour of the region. You're sure to love it, but you can always mix in some of your favourite meals from the UK when you want to. To make things every more versatile, you'll find many versions of a recipe. Why? Because different regions have different ways of making them. So don't try a dish only once. Make sure you get the full experience by trying several different versions! Many cultures have passed through the area currently known as Spain. And the country boasts a versatile landscape, including beaches, mountains, and pastures. This mix of cultures and lifestyles leads to great variety in Spanish cooking. Local ingredients are relied upon, so farm animals and crops and seafood are all common ingredients in Spanish cooking. 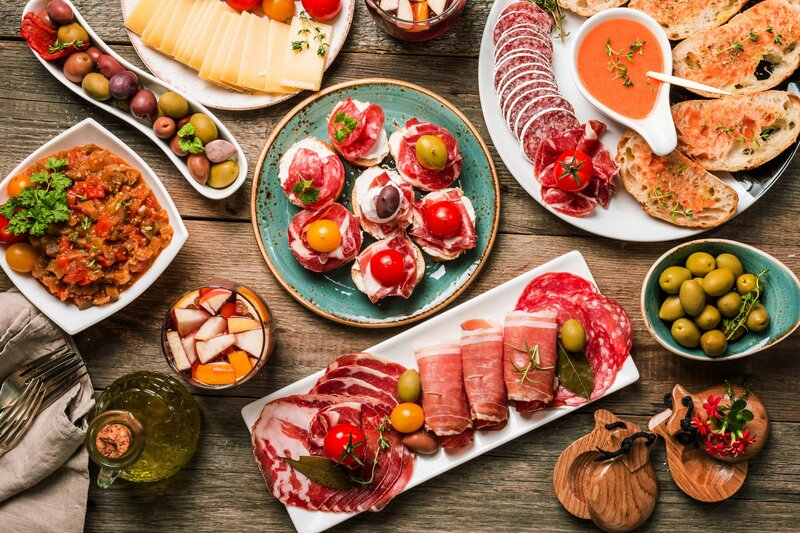 Now that you know a bit about the history of Spanish cuisine and how it's cooked, here are some common traditional recipes. This is a traditional Spanish cheese. Sheep's milk from La Mancha is used to make it. The cheese is firm but has a delightful texture that goes well with many dishes. Paella can be made in several ways, but the concept is the same in each variation. This saffron and rice-based dish hails from Valencia. To your rice, add your choice of meat, seafood, and vegetables. Traditional meat choices include rabbit, seafood, and snails. Beans and seasoning are also traditionally included. These traditional pastries are stuffed with meats, cheeses, and other ingredients. They're delicious whether baked or fried. Spanish Cooking: Try it Today! You have many things to look forward to in Spain, and Spanish cooking is definitely one of them. Get things started by trying some Spanish dishes today, or jump in a try them when you get there. Don't forget to try the same dish in multiple locations. You'll love the variety, and you're sure to find a favourite. Are you relocating to Spain because you're finished working? If so, read up on issues to consider when spending your retirement in Spain.